In December of 2017, Meridian 180 held a forum for insights on the North Korean nuclear crisis from an unconventional viewpoint, specifically the viewpoint of the North Korean elite. Professor Seok-hyang Kim of Ewha Womans University posed this hypothetical: Imagine yourself as a member of Kim Jong-Un’s inner circle, born and raised to rare privilege and rank in North Korea. How would you advise Kim when the wrong word could cost you your life of comfort if not life itself, but continuing on the present course be just as disastrous? A number of forum participants thought inaction was just about the only possible choice. Professor Sung-In Jun (Hongik University) brought up the option of feigning illness and checking into a hospital, which would be tempting but lead to ruin if Kim found it out. Professor Amy Levine (Changwon National University) wondered if drug addiction might be one way the elites were escaping this intolerable reality and/or making it more tolerable. Professor Levine drew several parallels between elites in at least the US and North Korea. Hiroyuki Hoshiro (University of Tokyo Institute of Social Science) also said he would give no advice and do nothing in that situation for the sake of his and his family’s safety. Seok-hyang Kim initially agreed that inaction was the safest course of action, but she rethought her position in a few days and pointed out that even elites who had done nothing could still be removed from their positions and executed. Even inaction does not guarantee safety in the cutthroat politics of North Korea. Amy Levine further brought up the possibility of our beleaguered member of the North Korean elite studying cases of internal rebellion to make contingency plans and cultivating allies under the guise of stopping such defiance. In response to Levine’s query Seok-hyang Kim gave information on rebellions against the current regime, such as the attempted coup of August 1956 and the planned march on Pyeongyang by the Sixth Army in 1995-1996. Both attempts failed and the leaders were purged, but the fact remains that the regime is not invulnerable to internal resistance. There are also smaller signs of resistance, such as anti-regime graffiti on the statues of Kim Il-Sung and Kim Jong-Il, or university students circulating critical pamphlets. Even these small defiances are all ruthlessly quelled, of course, but the simmering discontent is there. Based on this information, Jee Hyung Lee (Ewha Womans University) posited that our luckless advisor could leverage the threat of internal dissent by advising Kim Jong-Un that the current course could weaken the regime and foment internal enemies. He, or more rarely she, should make it clear that they could not even imagine rebellion, of course—our advisor’s only concern is to uphold the regime. Meanwhile, outside interests such as the United States and China could support these anti-regime groups without pushing too far, lest they invite another severe crackdown. Seok-hyang Kim agreed that this could be a useful course of action, and expressed her heartfelt wish that the endless threats and violations against North Koreans could be stopped. Professor Grace Kuo (National Cheng Kung University) quoted the Murakami Ryu novel Old Terrorists in arguing that the inaction of the elite could itself increase the dysfunction of the state and, correspondingly, the restlessness of the populace. Assuming that Kim Jong-Un could be persuaded that North Korea’s current course is unsustainable and that change is needed for the regime’s survival, Amy Levine wondered what kind of reforms could win domestic and international support. On the domestic front, would open markets work? A stronger social safety net? Internationally, would giving access to international weapons inspectors prove a popular idea? An eco-peace park in the demilitarized zone (DMZ) between North and South Korea? Seok-hyang Kim thought human rights education would have far-reaching effects, though it would not be easy to change minds. Professor Brendan Howe (Ewha Womans University) started from a rationalist approach to international relations, positing Kim Jong-Un, Donald Trump and others as rational actors who engage in goal-seeking behavior. National leaders like Kim and Trump would have multiple sets of preferences including national, institutional, and personal. Any North Korean advising Kim would have to determine which preference hierarchy dominates, and would have to suggest better ways than nuclear escalation, e.g. economic development, to achieve that preference. Friendly exchanges such as sports matches could also increase exposure to the outside world and smooth relations over. Professor Annelise Riles (Cornell University) suggested that our elite reframe the situation as one where Kim Jong-Un’s show of force has brought him victory, ensuring the security of the nation and the regime. With the United States weakened and Trump little more than a joke, Kim could present a powerful and reasonable alternative on the international stage and emerge as a true leader for global peace, nuclear non-proliferation, and anti-imperialism. Surely the Nobel Peace Prize was assured if he took this course of action. Seok-hyang Kim thought that perhaps Kim Jong-Un’s fondest desire was to be the kind of legitimate leader who could sign the Nuclear Non-Proliferation Treaty and be recognized for it. Amy Levine followed up on this idea to consider its ramifications. 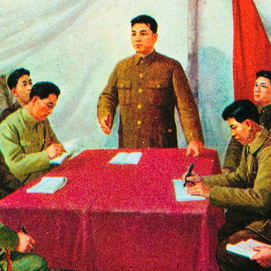 How could Kim Jong-Un and others be convinced that the future of the regime was secure? How would the international community be able to trust North Korea? Would the North Korean elite need to sacrifice some of their benefits and lifestyle, and would this be realistic? Relating to these proposed changes in international relations, Grace Kuo pointed out that the North Korean inner circle still needed to negotiate with the outside world in order to bring about these changes and wondered whether they could do so without compromising their appearance of absolute loyalty, which is paramount for their standing and even survival. She also wondered if Kim Jong-Un was even interested in being judged by the same metric as Western liberal democracies, whether status symbols such as the Nobel Peace Prize would mean anything to him. Seok-hyang Kim acknowledged these were both serious problems, and that the difficulties of any solution were very real. Jonas Grimheden (European Union Agency for Fundamental Rights) remained optimistic, however, and believed that engagement would still work in the long run. He advocated that the United States and other nations unilaterally lower their guards for a revival of the sunshine policy, with persistence being key. Seok-hyang Kim agreed, but also pointed out the difficulty of long-term engagement when the leadership of many of the countries dealing with North Korea, though not North Korea itself, were up for election every 4 or 5 years and were under pressure to produce visible results within that short time frame. Under these circumstances, Jonas Grimheden suggested a policy of “active waiting” for some tipping point into irreversible change, which would include as much engagement and interaction as possible without propping up the regime but perhaps strategically enhancing the leader’s self-confidence. (Amy Levine drew parallels to other strategies, such as Obama’s “strategic patience” and “making jam,” a concept proposed by Iris Jean-Klein in relation to Palestinians during the Second Intifada.) Our elite advisor could advise Kim Jong-Un that such engagement had many benefits in increasing his internal and external credibility. Seok-hyang Kim agreed this was the best course of action, though difficult for democratic leaders who had to engage in two-tiered thinking, considering both international relations and the short-term political impact on the next election cycle. This could make it difficult for them to shift from waiting to intervention when the moment of change did come. Under these circumstances, the North Korean elite are effectively left with no outside help and may have to prioritize their and their families’ safety. Seok-hyang Kim concluded the forum with a summary of the participants’ suggestions, which could be grouped into, first, inaction, which was the most immediately tempting but might not ensure our advisor’s safety in the long run; second, advising reform using the possibility of internal unrest as leverage, a course of action that had its own risks but opens up many possibilities; and third, advising engagement over the long term with the tacit support of North Korea’s neighbors who would engage with the reclusive regime while waiting for some tipping point of change. Professor Kim hoped that these solutions could help serve as a way to change the North Korean elites’ and Kim Jong-Un’s way of thinking, and perhaps to extract themselves from the dilemma of the current crisis. 2017년 12월에 열린 메리디안 180 포럼에서는 기존과는 색다르게 북한의 고위층의 관점에서 북한 핵 위기 문제를 다루었습니다. 이화여대 김석향 교수는 다음과 같은 가설을 제시하였습니다: 당신이 북한 김정은의 수하에서 태어나고 길러져서 특권층에 속해 있는다고 가정하였을 때, 김정은에게 당신의 안위와 목숨이 위태로워 질 수 있음에도 불구하고 어떤 식으로 뼈 있는 조언을 할 수 있을 것인가? 많은 포럼 참여자들들은 무위 (無爲), 즉 행동하지 않는 것이 유일한 선택이라고 말했습니다. 성인준 (홍익대) 교수는 아픈 척 하며 병원에 입원하는 방안을 제시했으나 이 또한 발각될 경우에 고문은 위험에 처할 수 있습니다. Amy Levine (창원국립대) 교수는 이처럼 견디기 힘든 상황에서 벗어나기 위해 고위층들이 마약 중독에 빠지게 되는 것은 아닐까 하는 의견을 제시했습니다. Levine교수는 이러한 특징들과 관련하여 미국과 북한 고위층들 사이에 연결 고리가 있다고 말합니다. 히로유키 호시로 (도쿄정경대) 교수는 그와 그의 가족의 안위를 위해서 아무런 조언 또는 행동도 하지 않을 것이라고 말했습니다. 김석향 교수는 초반에는 아무 것도 하지 않는 것이 가장 안전한 방안이라 말했지만, 아무 것도 하지 않는 고위층 또한 숙청되고 처형될 수 있다는 점을 지적하며 입장을 재고하였습니다. 극악무도한 북한 정치 상황에서는 무위 또한 아무 것도 보장해주지 않기 때문입니다. Amy Levine 교수는 사면초가에 몰린 북한 고위층들이 만일의 위기 사태에 대처하기 위한 내부 반란의 사례들을 연구하거나내부 저항을 제지한다는 명목으로 동맹을 구축할 수 있다는 가능성을 제기하였습니다. 이러한 Levine 교수의 제안에 대해 김석향 교수는 1956년 8월 쿠데타와 1995-1996년 제 6 부대에 의해 계획된 평양 행군 등 현 체제에 저항한 반란 사례들을 제시하였습니다. 두 사례 모두 실패했고 리더들은 숙청되었으나, 이는 체제가 내부 반란들로부터 안전한 것은 아니라는 것을 증명해 주었습니다. 뿐만 아니라 김일성과 김정일의 조각상에 반정부 낙서를 했던 사례나 대학생들이 체제를 비판하는 팜플렛을 돌렸던 것과 같은 작은 저항의 시도들도 있었습니다. 이러한 작은 저항들은 무자비하게 진압되었지만, 체제에 불만족하는 사람들이 존재한다는 것을 증명해 주었습니다. 이러한 정보에 기반하여, 이지형 (이화여대) 교수는 고문이 김정은에게 현 정부의 통치 방식이 체제를 약하게 할 뿐만 아니라 내부의 적을 조장한다고 조언하며 내부 반란의 가능성을 정치적 영향력 행사 수단으로서 사용할 수 있다고 말했습니다. 그러나 이 때 고문은 이 모든 것이 체제를 유지하기 위한 수단일 뿐이며 반란은 상상할 수도 없다고 확실히 말해야 합니다. 반면, 미국과 중국은 이러한 반정부 단체들을 지지할 수 있기는 하지만, 또다른 탄압을 야기하지 않도록 적당 선에서 멈추어야 할 것입니다. 김석향 교수는 이러한 조치가 유용할 수 있다고 동의하며, 북한 국민들을 향한 폭력과 위협이 중단되기를 바라는 진심 어린 소망을 내비쳤습니다. Grace Kuo (Cheng Kung 국립대) 교수는 무라카미 류의 소설 “Old Terrorists”을 인용하며 고위층들의 무위가 국가를 병들게 할 뿐만 아니라 대중들의 고통을 더할 것이라고 말했습니다. 김정은이 현 체제가 더이상 유지되기 힘들고 체제가 살아남기 위해서는 변화가 필요하다는 주장에 설득 당했을 때, Amy Levine 교수는 어떠한 개혁이 국내 뿐만 아니라 국제적인 지지를 얻을 수 있을 지 궁금해했습니다. 국내 측면에서, 자유 시장은 과연 가능할 것인가? 더 강력한 사회 안전망이 구축될 것인가? 국제적으로, 국제 무기 감시체제에 들어가는 것이 대중적인 의견을 입증할 것인가? 북한과 남한 사이의 비무장 지대에 평화 공원은 설립될 수 있을 것인가? 김석향 교수는 인권 교육이 모든 걸 해결할 수는 없겠지만 지대한 영향을 끼칠 수 있을 것이라 제안했습니다. Brendan Howe (이화여대) 교수는 목표지향적인 김정은, Donald Trump, 그리고 다른 이성적인 행위자들을 가정하며 국제 관계에 합리주의적 접근 방안을 제시했습니다. 김정은과 트럼프 같은 국가 지도자들은 국가적, 제도적, 그리고 사적인 이익에 따라 다른 우선순위를 가지고 있을 것입니다. 김정은에게 조언하는 북한 고문은 어떠한 우선순위를 취해야할 지 그리고 그러한 우선 순위를 이루기 위해 핵 확산보다 더 나은 방안들을 제시해야 할 것입니다. 스포츠 경기와 같은 우호적인 교류들은 보다 외부와 보다 친근하게 교류할 수 있도록 도움을 줄 것입니다. Annelise Riles (코넬대) 교수는 고위층들이 제시하는 방안들은 기존에 김정은이 국가와 체제의 안전을 위해 택했던 무력적인 방안이 지배하는 현실 상황을 재구성하는 데 기여할 수 있을 것이라고 제안했습니다. 농담에 지나지 않겠지만 미국이 약해진 상황에서, 김정은이 국제 무대에 강력하고 이성적인 대안을 제시하여 국제 평화, 핵 확산 방지, 그리고 제국주의 반대를 위한 진정한 리더로 부상할 가능성도 있습니다. 물론 그가 정말 이러한 행동을 취한다면 그는 노벨평화상을 받을 것입니다. 김석향 교수는 김정은에게 핵 확산 방지 조약에 서명하여 일종의 정당한 리더로써 인정받고자 하는 욕망이 있을 수도 있을 것이라 생각했습니다. Amy Levine 교수는 이러한 행동이 가져올 파문에 대해 논의했습니다. 어떻게 김정은과 다른 사람들은 체제의 미래가 안전하다고 설득 당할 수 있었을까? 어떻게 국제 커뮤니티가 북한을 신뢰할 수 있을까? 북한 고위층이 자신들의 이익과 특권을 희생할 것인가? 과연 이는 현실적일까? 이러한 국제 관계의 변화에 관하여, Grace Kuo 교수는 이러한 변화를 가져오기 위해서는 북한 내부 시스템이 외부와 보다 협조해야 할 것이며 과연 그들이 자신들의 절대적인 특권들을 포기하지 않고서 그러한 목표를 이룰 수 있을 것인 지 의아해했습니다. 그녀는 또한 과연 김정은이 노벨 평화상과 같은 서구 자유 민주주의 척도에 의해서 평가되는 것에 흥미가 있을 것인지에 또한 의아했습니다. 김석향 교수 또한 이러한 문제들은 매우 심각한 문제이며 해결책 또한 현실적이지 않다는 사실을 인정했습니다. 그러나 Jonas Grimheden (European Union Agency for Fundamental Rights) 씨는 긍정적인 태도를 보였으며 장기적인 관점에서 봤을 때 그러한 행동은 가능할 것이라고 확신했습니다. 그는 미국과 다른 국가들이 햇볕 정책의 부활을 위해서 주된 역할을 고집하며 일방적으로 수위를 낮출 것이라고 말했습니다. 김석향 교수는 동의했으나, 북한과 교류하는 국가들의 리더들이 4-5년을 단위로 교체되는 것을 고려하여 짧은 기간 성과를 내야한다는 점을 고려했을 때 장기적인 정책은 어려울 것이라고 지적했습니다. 이러한 상황 아래서 Jonas Grimheden 씨는 되돌이킬 수 없는 변화로 들어가기 전 티핑 포인트로 “적극적인 기다림” 정책을 제안했습니다. 이는 체제를 지지하지 않는 상태로 최대한의 교류를 추구하며 전략적으로 리더의 자존감을 높이는 것을 의미합니다. (Amy Levine 교수는 이를 2차 이랍인 반란 속 팔레스타인과 관련하여 Iris Jean-Klein이 제안한 오바마의 “전략적 인내”와 “잼 만들기” 정책에 비유했습니다.) 우리의 고위층 고문은 김정은에게 그러한 참여가 그의 대내외 신용을 위해 도움이 될 것이라고 조언할 수 있을 것입니다. 김석향 교수는 국제 관계와 다음 선거에 미칠 단기간의 정치적 영향력을 모두 고려해야 하는 민주적 지도자들에게는 이것이 어렵겠지만 최선의 선택이라는 것에 동의했습니다. 그들에게는 단순히 기다리는 것에서 변화가 필요한 시기에 간섭하는 것으로 행동을 옮기는 것이 어려울 수 있습니다. 그러한 상황 아래서, 북한 고위층은 외부의 도움 없이 그들 자신과 그들의 가족의 안전을 우선시하게 될 것 입니다. 김석향 교수는 참여자들의 제안들을 다음과 같이 요약하였습니다. 첫 째는, 행동하지 않는 것으로서, 단기적으로는 가장 매력적인 방안이지만 장기적으로 보았을 때 고문의 안위를 보장하지 못할 수도 있습니다; 두 번째는, 내부 불안의 가능성을 제기하며 개혁을 조언하는 것으로서,위험 요소를 내재하고 있지만 다양한 가능성들을 내포합니다; 세 번째는, 변화의 조짐을 기다리는 동안 북한의 적막한 체제와 교류할 의지가 있는 이웃 국가들을 암묵적으로 지지하며 장기적인 교류를 하는 것입니다. 김교수는 이러한 제안들이 북한 고위층들과 김정은의 사상을 변화시키고, 현재 위기의 딜레마 상황 속에서 벗어날 수 있는 데 보탬이 되길 바란다고 하였습니다.